Forest Park FX is an introducing broker to many of the world’s top FX brokers. In exchange for introducing clients to these brokers, they compensate us a portion of the spread or commission you pay on your trading. In turn, we share that compensation with you as a way to reduce your costs of trading below what the broker would offer you directly. When working with Forest Park FX, your account and funds are still held by the broker and you trade on the same pricing and platforms they offer to their direct clients. The key difference is that by being introduced through Forest Park FX, you will save money on every trade you place. Take a look at the How Forex Rebates Work infographic to see how you, too, can save money. Have a great idea for a trading algorithm, expert advisor (EA), or custom indicator? We can make it a reality. Whether you don’t have the time or lack the programming skills, our experienced team is here to help. We’re experts in coding for forex, and have built thousands of trading algorithms in multiple languages, including C++, Java, MQL4, and others. Why let a good idea go to waste? Have a chat with our programmers. They’ll work to take that vision from idea to integration to complete backtesting — and implement a trading algorithm that delivers sustained success. To discuss the development of your customized trading algorithm, please complete the form below. The Risk Management EA is a great tool to assist traders in monitoring daily activity on their accounts. 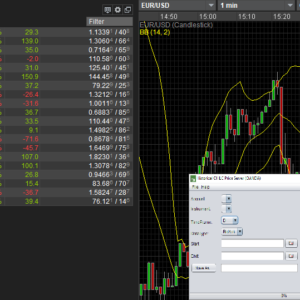 It provides the unique ability to set track profit or loss objectives and have trades close automatically, as well as have EA's disabled when any of these are met. The Bollinger Bands Range Trader EA buys and sells during a sideways market by measuring the correlation between the instrument’s price and the value provide by the Bollinger Band output. The indicator evaluates price volatility by comparing the high price and the low price within its own calculations. When the instrument’s price actions gravitates closer to one of the outer bands it should be taken as an increase in market volatility. Looking for reliable historical FX data online can be very difficult. Although it can usually be downloaded through most brokers’ APIs, unless you are a developer, accessing it is not feasible. This is why we’ve created a simple tool to do it for you. The Historical Price Data Tool will allow you to connect with your demo or live API enabled account to quickly and easily download data from multiple brokers. Looking for reliable historical FX data online can be very difficult. Although it can usually be downloaded through most brokers’ APIs, unless you are a developer, accessing it is not feasible. This is why we’ve created a simple tool to do it for you. The Price Data Tool will allow you to connect with your demo or live API enabled account at OANDA and download historical data for any of the symbols available through your account. Trying to decide which Forex broker is right for you? It can get overwhelming, fast. Each broker has different spreads, commissions, execution and pricing models, platforms, and regulations. It’s a lot to consider. We understand this. That’s why we’re here: to find you the best broker. We do more than leverage our knowledge and resources. We sit down with you — and learn about your trading goals, objectives, and preferences. To schedule a free broker consultation, please complete the form below. Or, if you prefer, use the Broker Wizard tool to find our list of recommended brokers for your particular trading strategy and preferences. We look forward to speaking with you and working together to improve your Forex trading experience. With an experienced staff of industry professionals, Forest Park FX specializes in creating custom FX brokerage and trading solutions for retail traders, service providers, institutional traders, money managers and hedge funds. Forest Park FX offers a wide variety of value-adding services, including market access through the world’s top Forex brokers, cash back rebates for retail traders, built-to-specification trading algorithms, administrative and operational support for money managers and customized liquidity for hedge funds and high volume traders.